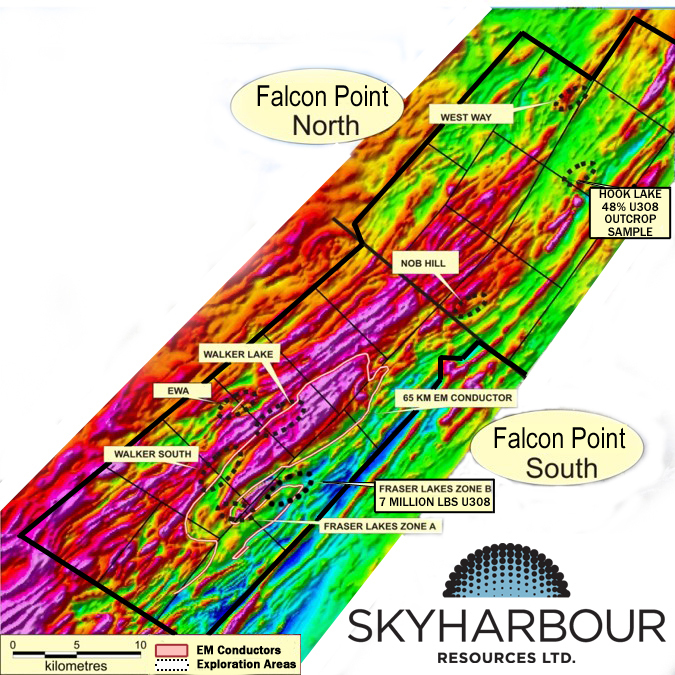 Vancouver, BC - Skyharbour Resources Ltd. (TSX-V: SYH) (OTCBB: SYHBF) (Frankfurt: SC1N) (“Skyharbour”) is pleased to announce it has commenced its diamond drill program on its 100% owned, 79,003 hectare Falcon Point Uranium and Thorium Project (the “Property”) located 55 kilometers east of the Key Lake Mill. The drill program will consist of drill testing high-priority targets in and around the current uranium and thorium resource at the JNR Fraser Lakes Zone B deposit. This will be the Company’s first work program at Falcon Point (previously called Way Lake) since acquiring the Property from Denison Mines in the summer of 2014. Approximately 1,500 metres of drilling by way of 5 �" 6 holes with individual depths of 250 �" 350 metres is expected to be completed in the JNR Fraser Lakes area during the current campaign. 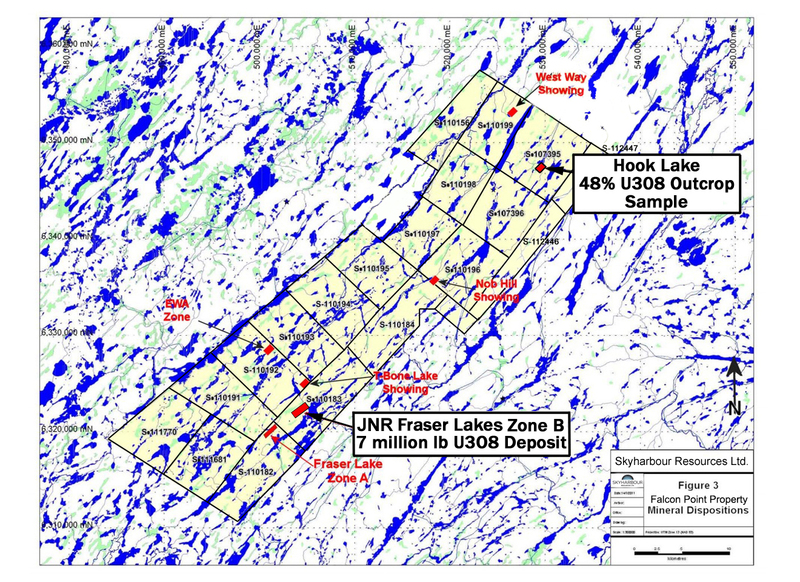 The JNR Fraser Lakes Zone B deposit consists of a current NI 43-101 inferred resource totaling 7.0 million pounds of U3O8 at 0.03% and 5.3 million pounds of ThO2 at 0.023% within 10,354,926 tonnes using a cutoff grade of 0.01% U3O8. The independent NI 43-101 technical report by GeoVector Management Inc. supporting this mineral resource estimate was filed on SEDAR on March 20, 2015 by Skyharbour Resources. Independent qualified person, Dr. Allan Armitage, P.Geo., is responsible for the contents of the technical report and comments related to the resource estimate and its parameters. The deposit subcrops and was not tested below 150 metres vertical. It is open along strike and at depth, and consists of several zones of moderately dipping, multiple-stacked uranium and thorium mineralized horizons. Geological and geochemical features at the deposit show distinct similarities to high-grade, basement-hosted uranium deposits in the Athabasca Basin such as Eagle Point, Millennium, P-Patch and Roughrider. 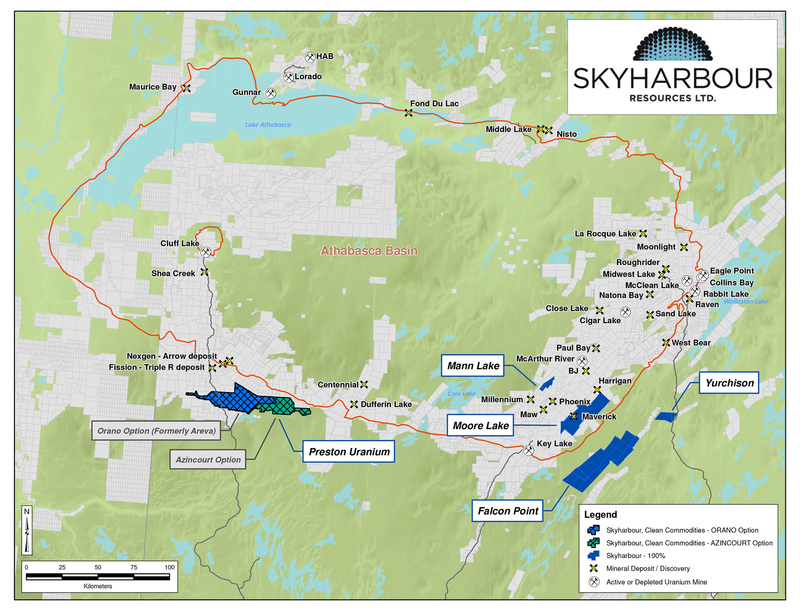 Skyharbour’s objective is to discover higher grade uranium mineralization proximal to the current lower grade mineralized envelope present at the JNR Fraser Lakes deposit. The current drill program will test for depth extensions to the known mineralization which is associated with a conductive zone located on the western limb of a prominent fold that closes to the north. Additionally, it will be the first test of the conductive eastern limb of the structure in an area where it is intersected by a regional scale east north-east trending fault. Skyharbour holds interest in an extensive portfolio of uranium and thorium exploration projects covering over 350,000 hectares in Canada's Athabasca Basin and is well positioned to benefit from improving uranium market fundamentals with four drill-ready projects. The Company is the operator of the Western Athabasca Syndicate which controls a large, geologically prospective land package consisting of five properties in the Athabasca Basin of Saskatchewan. Skyharbour also owns a 100% interest in the Falcon Point (formerly Way Lake) Uranium Project on the east side of the Basin which hosts an NI 43-101 inferred resource totaling 7.0 million pounds of U3O8 at 0.03% and 5.3 million pounds of ThO2 at 0.023%. The Company owns a 60% interest in the Mann Lake Uranium project on the east side of the Basin strategically located adjacent to the Mann Lake Joint Venture operated by Cameco with partners Denison Mines and AREVA where high-grade, basement-hosted uranium mineralization was recently discovered. Skyharbour’s goal is to maximize shareholder value through new mineral discoveries, committed long-term partnerships, and the advancement of exploration projects in geopolitically favourable jurisdictions.